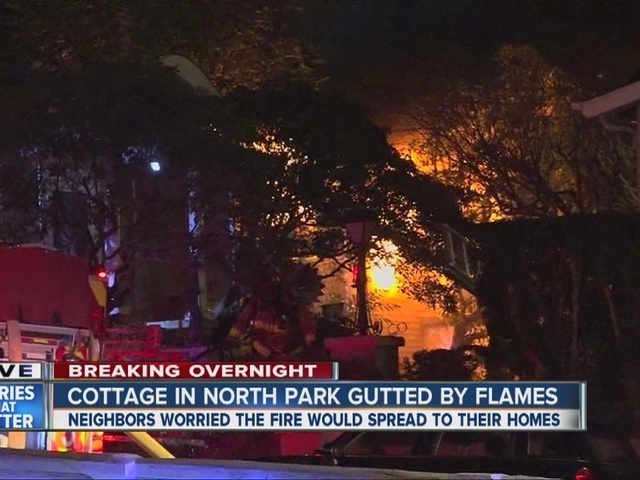 SAN DIEGO – Combustible materials stacked in front of a wall heater sparked a fire that caused at least $250,000 in damage to a bungalow-style home in the North Park neighborhood early Wednesday morning. Firefighters were sent to 1818 University Ave. after receiving multiple calls reporting the home had caught fire, according to Capt. Joseph Amador of the San Diego Fire-Rescue Department. Crews arrived to find flames shooting from the front windows shortly after 2:30 a.m. The blaze was knocked down in about 15 minutes, and firefighters contained it to a front room, Amador said. The tenant was not home at the time and no injuries were reported, according to the fire captain. Amador urged residents to be careful as the weather gets colder, have heaters checked out by utility workers and to keep anything flammable away from heaters.